“Ok, I think that’s everything... Looped down into the sewers, handled everything before Gascoigne, and cleared out all the Huntsman’s Minions in the back alleys. Central Yharnam should be completely empty. It’s my sixth venture into New Game+, the final time the game increases its difficulty. Bloodborne is already a challenging game, and the difficulty has been ramping up each time I’ve chosen to complete it. Of course, I could have merely stopped near the end of the first or second run, capping the difficulty there and doing what I needed to then, but where was the sport in that? The game still had challenges to offer, and how could I turn that down? … Sometimes I make poor life choice. This run is specifically dedicated to learning the ins-and-outs of the Threaded Cane Trick Weapon, technically one of the “Starter Option” weapons available, but as with all the Trick Weapons in Bloodborne, none are really better than the rest, so “starter weapon” or not, it’s just a matter of preference and play-style. That being said, I longingly look at my +10 Ludwig’s Holy Greatsword in my inventory, my favorite and primary weapon in previous runs. It turns out that, while I like to think the grace and finesse of using a sword-cane that transforms into a serrated whip would be more my style, in reality, smashing things with a giant greatsword felt much more rewarding to me. Still, the point of this run wasn’t just to complete the game, it was research. In transitioning the Trick Weapons, arguably the most iconic part of Bloodborne, into the boardgame, they had to feel right. They had to feel like their proper representation in the game. Sure, I could have gone online, read about them, seen their stats, what players have said about the weapon, all that… But to really understand it, I felt I needed to experience it- devote actual time to it. It turns out that in this particular case I really, really missed my Greatsword. This style of quick attack-dodge-quick attack-transform-whip-whip-dodge, while visually impressive, just wasn’t for me. Again, I remind myself though that that wasn’t the point. I wasn’t making this weapon for me, I was making this for the players who opened the box, saw a Hunter with a Threaded Cane, and went “Yes! Dibs on the Threaded Cane! That’s my jam!” (Which is totally a real thing someone would say). It was important that, when they began using that weapon, it felt like how they would expect it to feel- that their play experience would match their expectations. If they picked that weapon and felt more like they were wielding a Kirkhammer or Torch/Shield combo (hopefully you get that joke) then somewhere along the design process, we messed up. Having cleared Central Yharnam for the third time this run, I returned to the dream and put the controller down. This run had been, let’s say, enlightening. Opening up the file that contained the Trick Weapons, I began editing. While I had originally made it so the Serrated-Whip side dealt more damage than the Threaded Cane, during my plays I had found that to be quite the opposite-case. And while I knew that the Whip provided more security and defense due to it’s increased range, I didn’t fully appreciate that fact until I had actually played with it- Again, a difference in reading about something versus experiencing it. This made me realize that the abilities I had assigned to each side really should have been reversed. The Whip, the side I had assigned to be the higher damaging side, should in fact have been more of a defensive side, whereas the Threaded Cane should be give the higher damage of the two. It was little things like this which saw me arriving at my sixth+ play-through of the game. 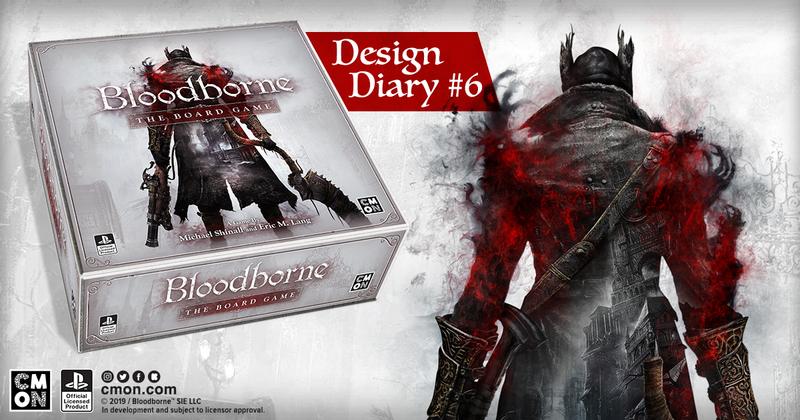 Sure, it might have been a bit extreme, given the total percentage of the experience that, when looking at the boardgame as a whole, would bring, but to me it was a very important one… Of course, it didn’t hurt that I really really enjoyed playing Bloodborne as well. Something about it just resonated with me and, what had started as research for the game, had grown into a deep appreciation and fandom of the setting and style of the game.